The Canon PIXMA TS6020 Wireless Inkjet All-In-One Printer is the everyday printer that's up to the task. Depend on it to print term papers, shipping labels, envelopes, concert tickets, or fun family photos and be confident that they'll all look great. This small, versatile, multifunction printer is an easy fit wherever you decide to place it in your home. Got a tight spot? The PIXMA TS6020 printer fits the bill and looks good too. Want the convenience of printing from just about any device from just about anywhere? 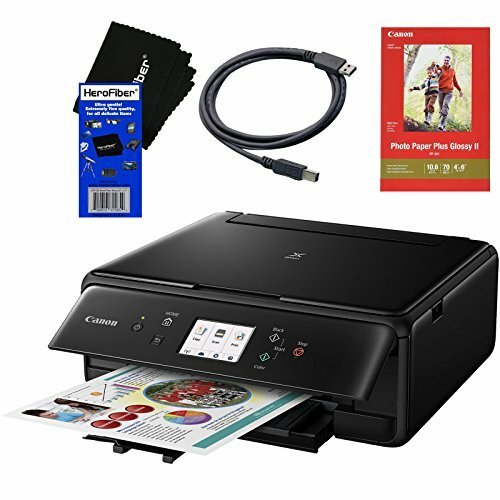 The PIXMA TS6020 printer is your answer because it can connect to all your devices through Wi-Fi, AirPrint, Google Cloud Print, USB and even directly from the Cloud. Not only that, it's iPhone/iPad compatible making it one of the best home printers for your phone and tablet, in addition to you Mac or PC. Performance is top notch because of its five-ink system that prints detailed pictures and documents, its fast output speeds, and its ability to print beautiful borderless photos. Looking for compact, quality printing at home? Take a good look at the Canon PIXMA TS6020 Wireless Inkjet All-In-One Printer.